The outlook for the Brazilian food sector is benign, due to an ongoing economic rebound and robust demand from China as largest food export market. 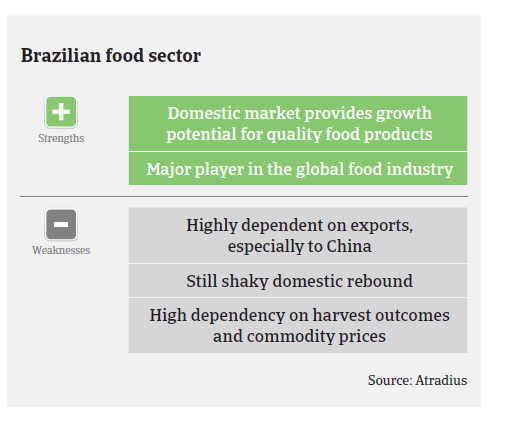 The 2018 outlook for the Brazilian food sector is benign, due to an ongoing economic rebound and robust demand from China as Brazil´s largest food export market. A very good harvest in 2017 has reduced prices of several food products (especially bread, rice, and cereals), leading to higher consumption. Domestically the return to economic growth and decreasing inflation has increased consumer purchasing power. The meat segment is recovering from a difficult 2016, when prices for animal feed increased due to a severe drought. Additionally the meat processing industry was hit by a major meat scandal that seriously affected exports. Dairy products consumption will continue to grow, driven by rising disposable incomes, population growth and the increased perception of dairy products as being healthy and nutritious. The sector is still very fragmented, however due to the trend towards premium products in the food industry it is rapidly consolidating, with all leading dairy businesses keen to increase their market share. Exports of fruits, vegetables, cereals and soy beans increased further in 2017 due to higher than previously expected demand from China. In 2018 the outlook for further export growth looks promising. Food retailers have been generally resilient during the recent economic downturn. However the continued high unemployment rate and ongoing economic difficulties in some regions could impact some local players. The profit margins of Brazilian food businesses have increased in 2017, and further growth is expected in 2018. 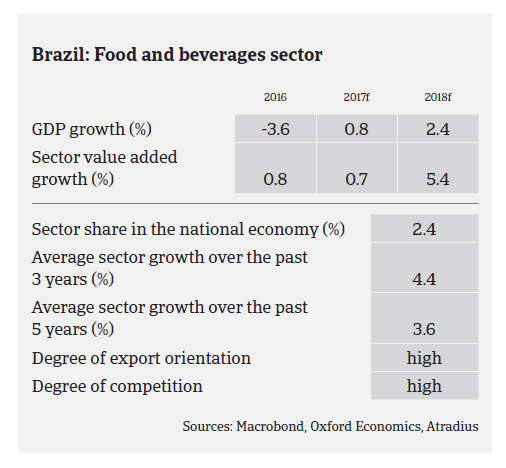 On average food companies are more highly geared than businesses in other Brazilian industries, mainly due to major business expansions before the 2014 economic downturn. As a consequence of the ongoing economic rebound banks have again become more willing to provide loans to food businesses, although still gradual and pursuing a prudent approach. Within the food sector payment terms differ, depending on the subsector and a company’s position in the value chain. While in the past farmers were generally paid up front, in some cases payment terms have been extended to 30 days. Payment terms in the meatpackers segment range from 60 to 90 days. In the dairy industry payment terms differ, depending on the position in the value chain (producer or retailer). We observe a maximum payment term of 90 days on average in the food industry. 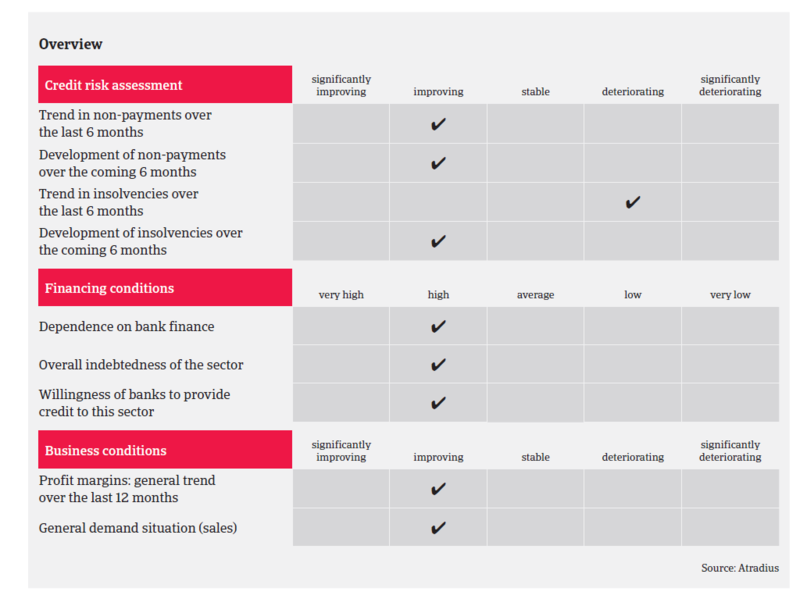 After increasing in 2015 and 2016, payment delays in the sector have started to decrease in 2017 due to the improved economic outlook, and further decline is expected in 2018, coupled with less insolvencies. Therefore our underwriting stance for the food sector is generally open. However, we are still more cautious with regional food retailers active in certain federal states that still face economic difficulties. The same applies for the meat segment due to the repercussions of the recent meat scandal and the effects of high cereal prices of 2016. Despite a rebound agrichemicals remains susceptible to sudden changes of exogenous factors like climate, market prices and exchange rate fluctuations.